On any given day along San Diego County’s 70 miles of coastline, thousands of surfers may be spotted in the ocean, riding waves or patiently waiting for the next one. 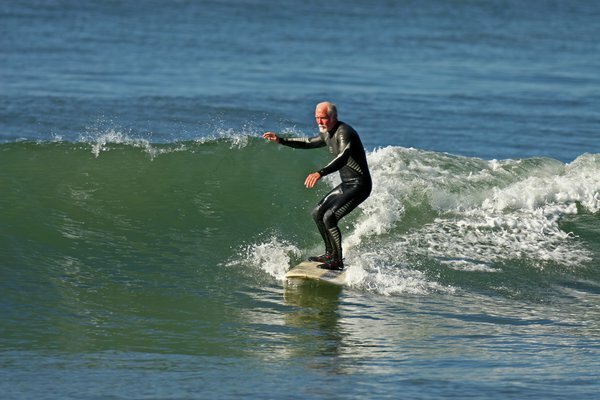 A new study underway at California State University San Marcos seeks hard, scientific data on whether amateur surfing is more than just fun — whether it also provides a dynamic physical workout. “Studies have been recently conducted with professional surfers in competition, but there is limited research on the average person who surfs recreationally,” said Assistant Professor of Kinesiology Sean Newcomer. Most surfers are strong swimmers with a keen sense of balance. Stamina and upper body strength are crucial in order to paddle from the shore through breaking waves to reach the surf line. Once there, surfers wait on their boards and then paddle intensely when the right wave presents itself. As the wave peaks, a surfer must pop up rapidly and smoothly to his or her feet from a lying down position, balancing in a fluid upright position as they glide on the breaking wave toward the shore. “Surfing can definitely be considered a form of interval training which combines short, high intensity bursts of speed with a recovery phase, repeated during exercise training,” Newcomer explained. The research project is part of Newcomer’s course, Introductory Exercise Physiology 326. Fifteen students who took the course during fall semester are now interns on the project, mentoring the 40 students who are currently in the class. The students are responsible for every aspect of the research protocol, which includes both laboratory and field work. Students meet research participants at the beach to outfit them with waterproof heart-rate monitors that are synchronized to a video camera filming them while they are in the ocean. Students also test the participants’ upper body muscular power and utilization of oxygen using a swim bench customized with a surfboard to simulate paddling. Over the next two years, Newcomer and his students hope to study 600 surfers. Surfers who are interested in participating in the study are encouraged to e-mail snewcomer@csusm.edu. Surfing can definitely be considered as the perfect sport.